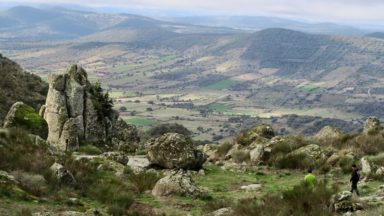 There is a walkers’ paradise in Extremadura called the Narrow Pass of Hell. 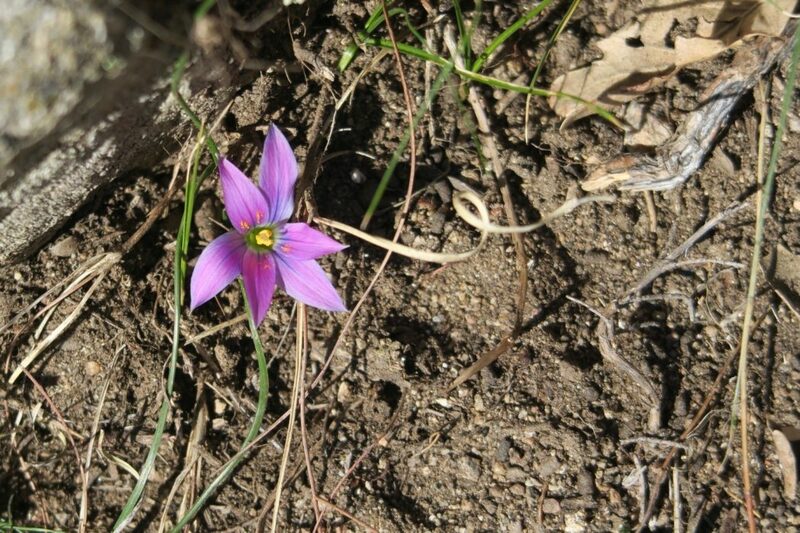 On a beautiful last Sunday in February, Gisela Radant Wood found out how it got its name. 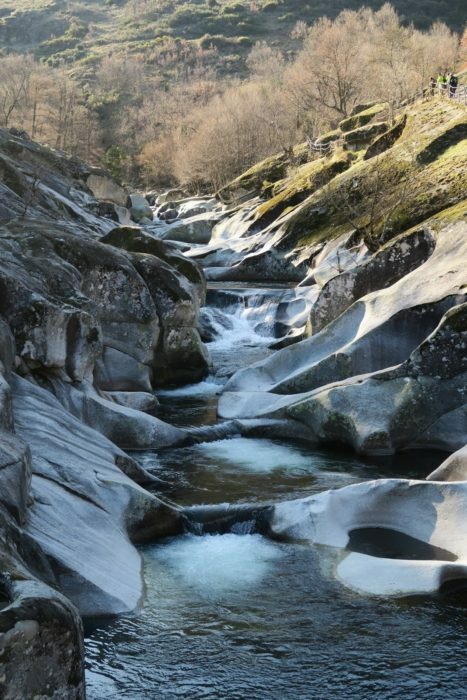 In early spring, when the streams that start high up in the Sierra de Tormantos are full of snow-melt, the water crashes down narrow passes on the mountain sides, bringing with it granite boulders of varying sizes. The noise is supposed to sound like Hell. 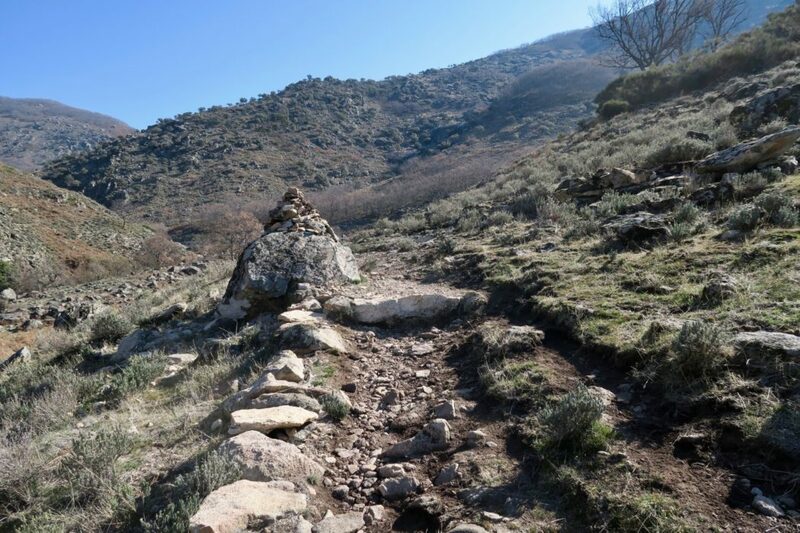 Instead of the start indicated in Walk 10 in The Sierras of Extremadura, we – a group of about 40 friends from villages in the Sierra de Montánchez – started from the Interpretation Centre where there are more places to park. 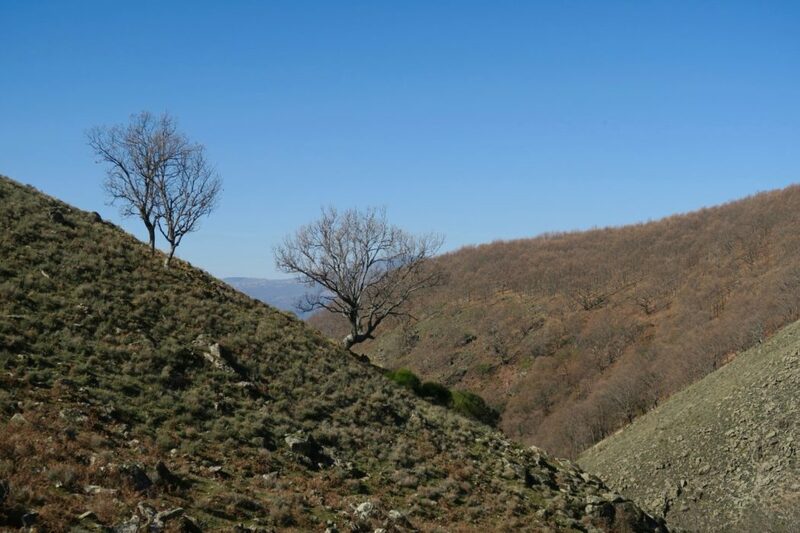 We followed the finger signposts and began the walk up the woodland path that zig-zags through deciduous oaks and chestnut trees to join the main path from Jerte. The woods were in shadow but we could already see the sun on the opposite side of the valley. We followed the signs until we came to one that took us down to Los Pilones, a favourite place for summer swimming. 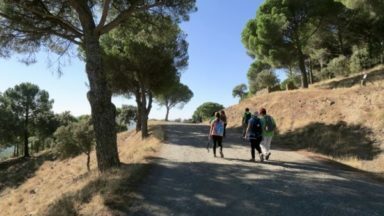 We crossed the bridge and zig-zagged up to a junction: right goes to Cabezuela del Valle on a pretty footpath and left goes to Puente Nuevo, with more options along the way. 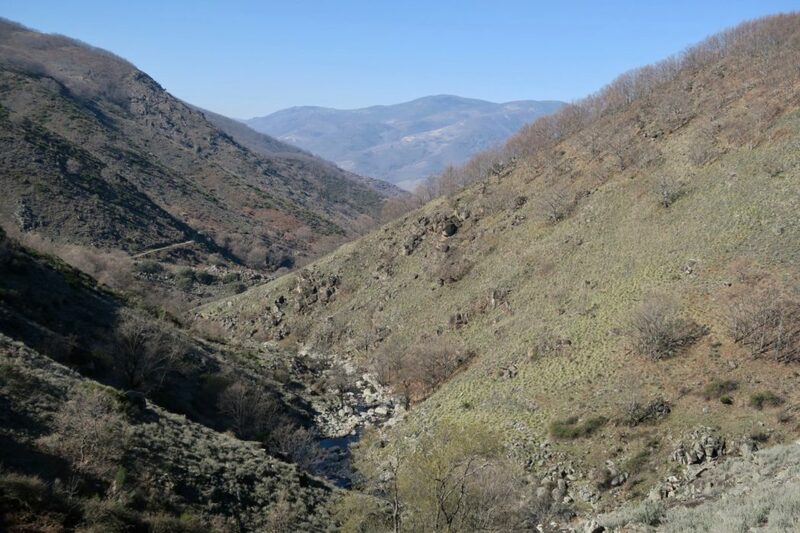 We went left and walked on the earth and granite-paved path that shadows the river below. 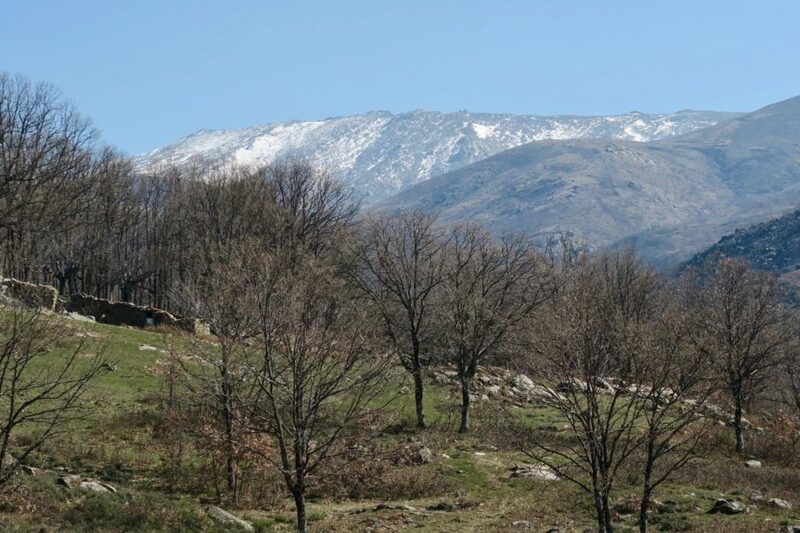 On the right are the high mountains of the Sierra de Tormantos. 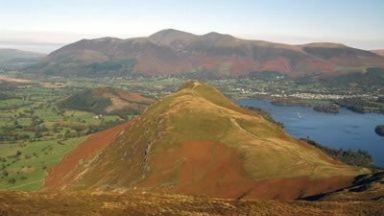 Ahead are fold after fold of mountains, with the highest peaks covered in snow. The path is wide enough for two people to walk comfortably side by side. Some of us hadn’t seen each other since the previous Sunday’s walk so there was a lot of socialising. 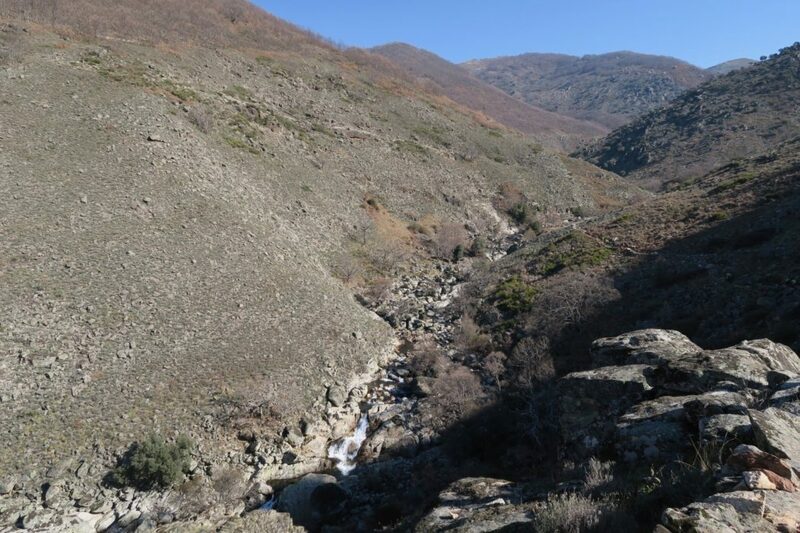 There was also a lot of stopping to look at views, point out early flowers, search for birds above and a lot of discussion about whether we would be able to cross the Vado Cantares, the ford, ahead. 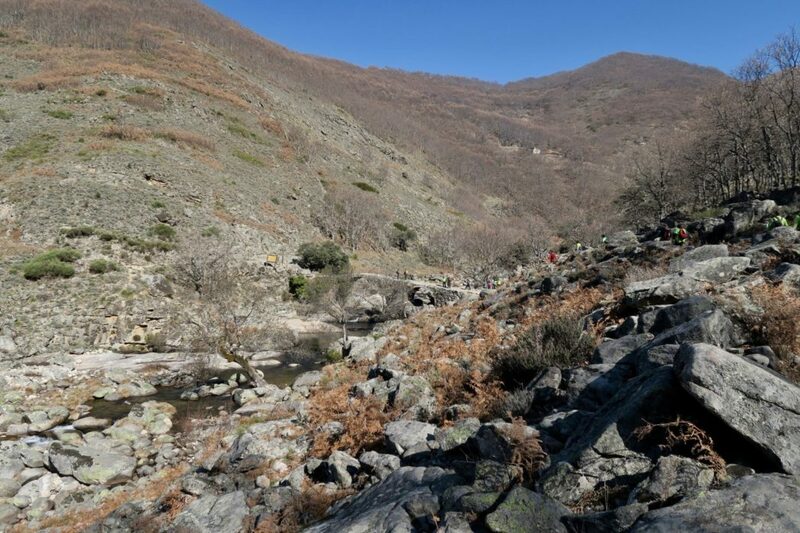 The path has granite water channels that run across it at intervals to carry water down the side of the mountains on the right to the river below on the left. 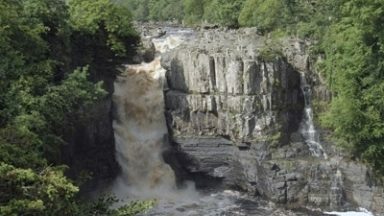 At one point there is a good fall of water and, even though it had not rained for a while the cascade was impressive. The lavender bushes that line the path were not yet in flower but other bushes had small buds. We passed Puente Sacristán and the Refugio del Pescadores, the Fisherman’s Refuge, on the left. Smoke was coming from the refuge’s chimney so some lucky people had stayed overnight. The bridge is important because if the ford is not negotiable it is the other way to get across the river, other than going all the way back to the bridge at Los Pilones. When we got to the ford we felt pretty confident that we would get across. 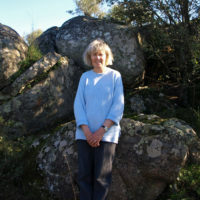 The water level was fairly low and there were many exposed granite boulders from which to step from one to the other. We must have taken nearly half an hour to negotiate the ford. 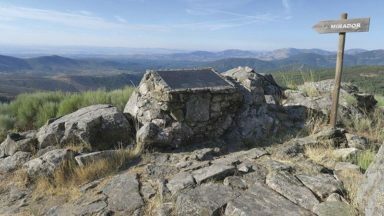 That included time to dry the socks of Estéban and Juan, who had slipped into the water, dress Raquel’s grazed knee, which had collided with a boulder, and strap up the ankle of Alonso, who had twisted it doing some pretty impressive, but ultimately disastrous, pirouettes on an extra big boulder. Thank goodness we always carry a basic first aid kit. However, it was sunny and warm and, once we were all across the ford, jackets came off and we ate second breakfast by a pretty, natural pool. It is popular in the summer with people who want to swim – but not with the crowds at Los Pilones. The next part of the walk, from the ford to Puente Nuevo, is dramatic. The path gets narrower and higher. 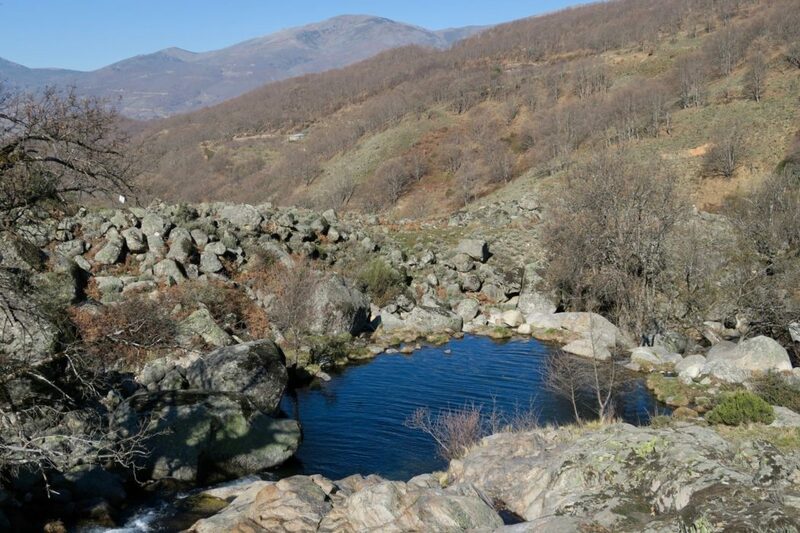 The view on the left to the river below is impressive and so is the roar of the water going over boulders and rushing through narrow passes. Here is where Hell starts. 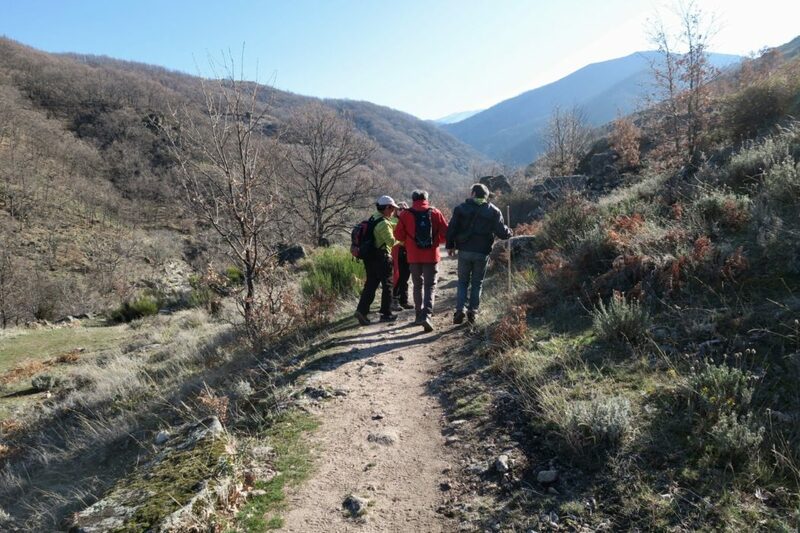 Once we got to within sight of the bridge, half the group decided to turn right and walk into Jarandilla over Collado de las Yeguás, 1,470m and another 20km. 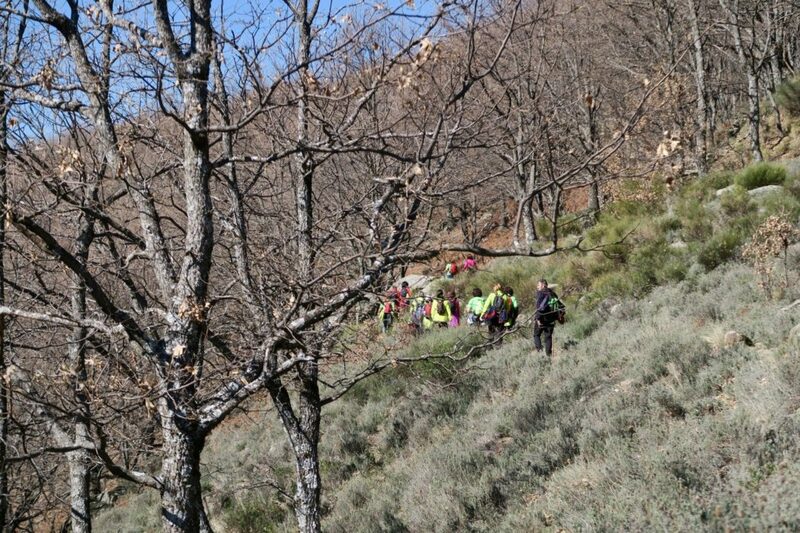 The rest of us Sunday walkers took the shortcut back to Jerte, over Collado de las Losas, 973m. 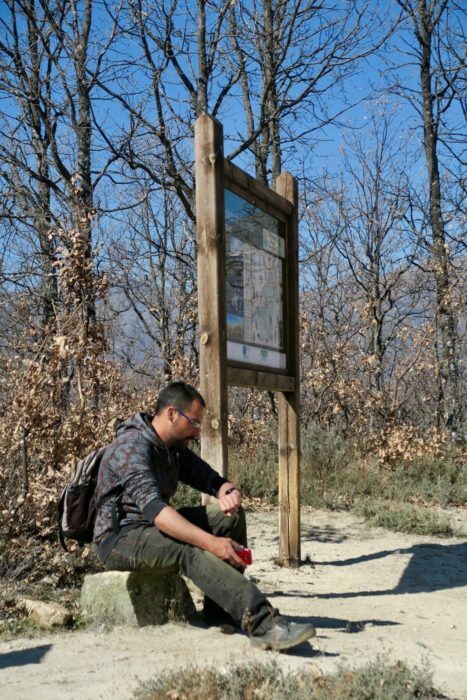 I own up to doing the shorter, 16km, walk but that was mainly because Alonso was walking quite slowly, nursing his ankle. 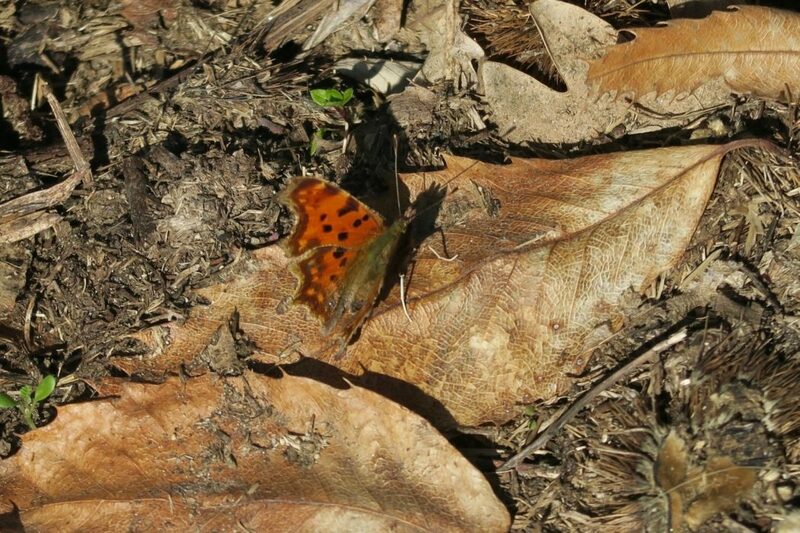 I am always slow when I take photographs. 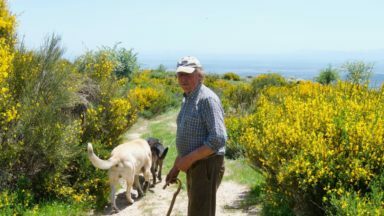 We walked together, lagging behind and talking companionably. 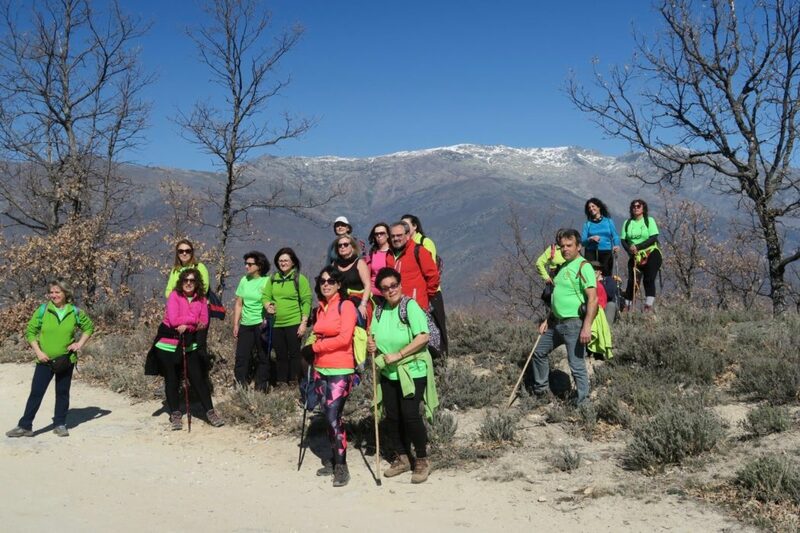 By the time we got back to the Interpretation Centre, had a beer in the café, got on the bus and got to Jarandilla, the group who had walked over the mountain were there to meet us in the terrace bar of the Roble Hotel. Great timing! 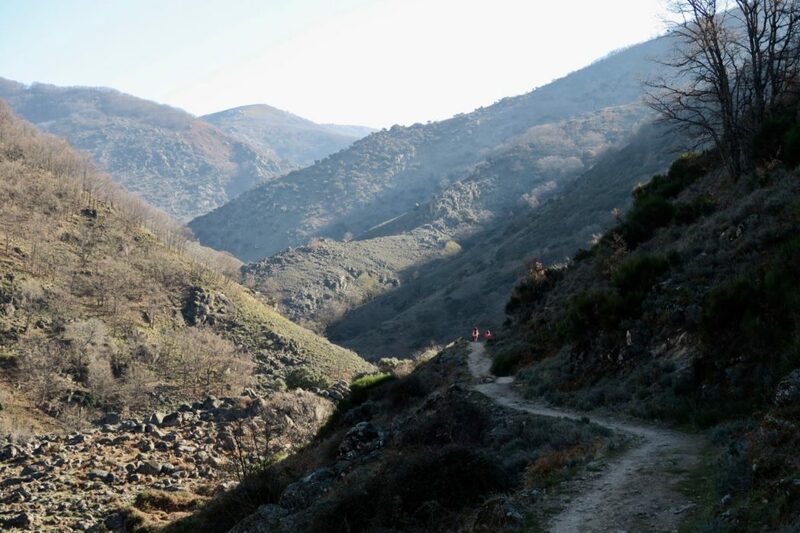 This walk is a variation on Walks 10 and 11 in The Sierras of Extremadura.